Nissan Land Glider | What Car? Is it a car? Is it a motorbike? No it's the Nissan Land Glider and it's making its debut here at the Tokyo motor show. The electric vehicle has rounded tyres like a motorbike, it leans through the corners like a motorbike and, at just over a metre wide, it's not much wider than a motorbike. However, it can seat two people, has four wheels, a steering wheel and a hard cocoon that covers the driver and passenger. To us, that makes it a car. 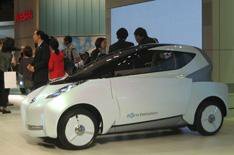 The initial concept was to build an electric vehicle that is easily manoeuvrable in the city. With two electric motors that power the rear wheels, the Land Glider has a range of 120km (75 miles) and a top speed of 100kph (62mph). The car also has a non-contact charging system it charges when the car is parked over a special charging pad. This system enables vehicles to be charged wirelessly at locations where the infrastructure exists. Nissan says: 'While the Land Glider is a concept car created for the Tokyo motor show, it should not be regarded as a mere design study. Which is business speak for 'no'.